Police are reminding holiday shoppers to put away shopping bags and other valuables in a locked trunk after a rash of cars were broken into at Valley Fair Mall in San Jose. Thom Jensen reports. Police are reminding holiday shoppers to put away shopping bags and other valuables in a locked trunk after a rash of cars were broken into at Valley Fair Mall in San Jose. The most recent incident happened Tuesday night in the mall parking lot just outside Nordstrom. Andrea, who did not provide her last name, returned to the lot after shopping and found her window shattered. Her vintage Louis Vuitton work bag was snatched from the back seat during the break-in. Andrea then noticed more shoppers with the same shocking discovery in a packed parking lot. Four other cars were also broken into in the two hours she was shopping. "It happened very quickly," she said. "They just went from one row to the next." But there is much more than the five break-ins reported Tuesday. 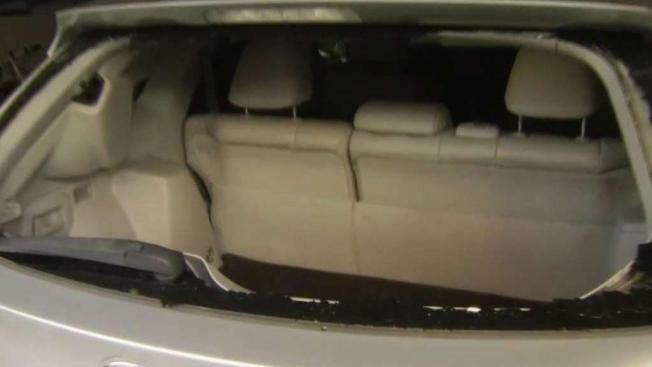 NBC Bay Area examined 911 calls for help and found 21 other similar incidents -- car burglaries and thefts -- in the neighborhood in the past two weeks. Andrea said she learned a valuable lesson. "Now I know to be careful no matter where I park," she said.